War is catastrophic, it is your worst nightmare made real. The freedom we enjoy today was won at a heavy cost - Many of us at Celtica Radio have a military service connection, or our families have served in the forces. This page is dedicated to all who lost their lives during World War 2, and in memory of the sacrifice that was given in 1944. Initially, May 1944 had been the time chosen for the invasion, but difficulties in assembling landing craft forced a postponement until June. On May 17th, Eisenhower fixed as the unalterable date June 5th. As the day approached, and troops began to embark for the crossing, bad weather set in, threatening dangerous landing conditions. After tense debate, Eisenhower and his subordinates decided on a 24-hour delay, requiring the recall of some ships already at sea. Eventually, on the morning of June 5, Eisenhower, assured of a weather break, announced, "O.K. We'll go." Within hours an armada of 3,000 landing craft, 2,500 other ships, and 500 naval vessels-escorts and bombardment ships, began to leave English ports. That night, 822 aircraft, carrying parachutists or towing gliders, roared overhead to the Normandy landing zones. They were a fraction of the air armada of 13,000 aircraft that would support D-day. Meanwhile, the German high command, in the absence of Rommel, who was home on leave, began to respond. Hitler was initially unwilling to release the armoured divisions for a counterattack. When he relented after midday, elements of the 21st Panzer Division drove into the gap between the British 3rd and Canadian 3rd divisions at Sword Beach and Juno Beach and almost reached the sea. Had they done so, the landings might have failed. Fierce resistance by British antitank gunners at Périers-sur-le-Dan turned the tide in late evening. As mentioned above, many of us at Celtica Radio have a service connection. Listed in alphabetical order are some of our relatives who served in the WW2 Conflict. Sgt. William John Barnett RAF. - Bill Barnett was a Rear Air Gunner on an Avro Lancaster, a close relative of Bill Everatt, his widow became Bill Everatts' Godmother. Curiously it was the exploits of WW1 German Fighter Ace Manfred Von-Richthoven that inspired Bill Barnett to volunteer for the RAF in the first place. He wanted to be a Pilot, but because of his age - [he was too old] - he was turned down, so became a Rear Air Gunner instead. When he and his young wife Elizabeth [Betty] had a child, they named him Manfred. 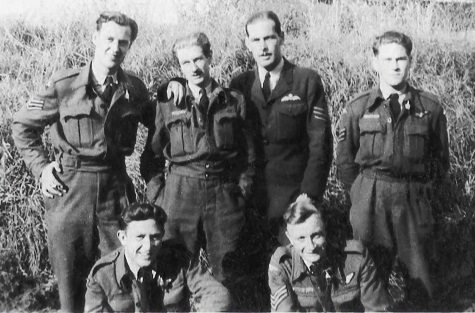 2235180 Sgt William John Barnett was with 84 OTU when on the night of the 4/5th Sept 1944 he was one of six crew on board Wellington HF570 which took off from Desborough for a navigational training flight. The aircraft returned to base at 02.05am and whilst in the process of landing the starboard engine failed. The pilot, P/O R.E. Byrne tried an emergency landing but the aircraft struck a tree and burst into flames. Three of the six crewmen were killed. 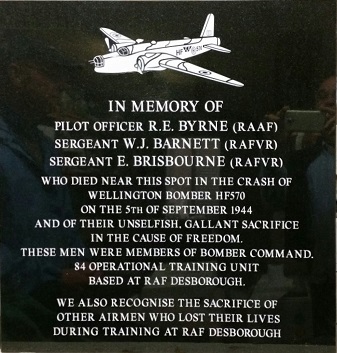 P/O RE Byrne, RAAF, buried in Botley Cemetery, Oxford. Sgt W.J. Barnett, buried in Sarn Cemetery Wales. Sgt E. Brisbourne, Buried in Much Wenlock Cemetery. Click Here to listen to "Battle Cry"
RAF Regiment Gunner. William Emason Cook. 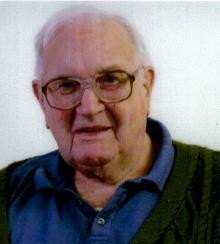 - David Cooks' Father, who joined the Royal Air Force after he was refused service with the Royal Navy. He volunteered at the Durham recruiting centre. Whilst in the RAF he trained as a Wireless Operator Air Gunner. Although he passed gunnery school element, but did not complete the Wireless Operator element. 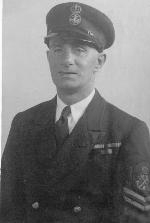 William Cook served with his squadron in various places throughout the war left with an honourable discharge, and exemplary service record. PO. Charles Risby: - [usually known as Charlie or Sonnie] The Great Uncle of Ed Risby, was a deep sea trawler man seconded to the Royal Navy during the war. Charlie undertook the extremely dangerous task of sailing on converted trawlers which were being used as minesweepers. With His Sgt stripes on. He survived the war, and gave permission for the publication of this picture. Mr. A Watts died on the 23rd June 2004. He did visit the site to see this information. Our heart felt thanks go to his family and condolences. The most recent picture was taken in 2004. 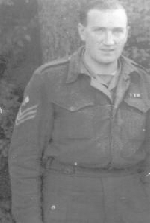 Cyril served with the 7th Armoured Division. He was in the Anti Tank unit, serving in Egypt, Solerro, and D-Day itself. In memory of Colonel Robert Morgan. He was Captain of the Memphis Belle, he named her, and flew most of the 25 missions, Colonel Morgan passed away May 15th 2004 after a long fight with serious illness. 'The Memphis Belle' story caught the hearts, and minds of many people making a new generation curious, and eventually aware of the freedom given through sacrifice from all the young men and women of the armed forces, and civil organisations. We mourn Colonel Morgan's passing. 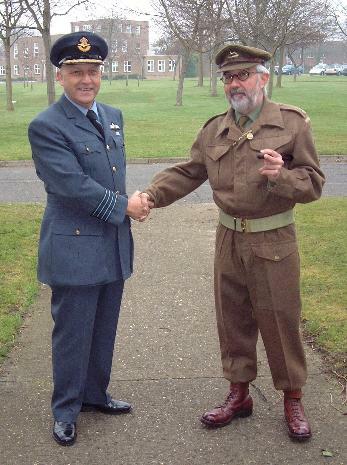 In this picture David A Cook and Ken Smith are seen in the uniforms of a Royal Air Force Group Captain, and British Army Major. They are Second world War Re-enactors, who are often referred to as 'Living memorials', people who maintain 'the living link' to show the sacrifices, and the lives given for our security, and freedom. They are part of a re-enactment group, called 'The Squadron' which primarily recreates the RAF element, but also includes 'Home Front' re-enactors too. So if you want to re-enact the role of an ARP Warden, a Land girl, a Policeman or whatever they would love to hear from you. You can contact David A Cook for details of 'The Squadron' by: Clicking Here or leave a telephone message for Cooky on 07005-963-770 and press option 1. Most web browsers automatically accept cookies; but you can stop this by changing the settings of your browser. Please be aware that if you stop your browser accepting cookies, some websites may not work properly on your computer. Copyright MMXIX Celtica Radio. A Division of AlBilCo MediaComm.